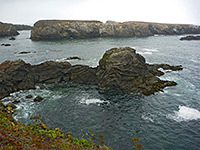 Mendocino Headlands State Park contains a section of the deep valley of the Big River, all thickly wooded and crossed a 4 mile trail, but the main component of the park is a small area of the adjacent coastline, next to the peaceful town of Mendocino. The preserve, one of several dozen state-managed properties along the Pacific coast of north California, lies just off Hwy 1 about halfway between San Francisco and Redwood National Park, in between two other state parks, Casper Headlands and Russian Gulch. Entry is free, and there are few facilities; the main activity is walking along the cliff-top paths overlooking the ocean. The coast hereabouts resembles many other locations - the ocean is bordered by low bluffs concealing little caves, inlets and beaches, while just offshore are sea stacks and small islands. The rocks are sandstone, orange or grey in color, eroded into a variety of forms. 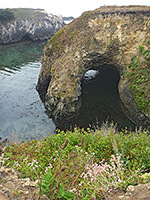 The peninsula is covered by a good variety of wildflowers, including a range of invasive species. All of the coast can be seen in just an hour or so, but the landscape is surprisingly varied, with quite different scenes just a short distance apart. The park also contains one longer beach, sandy and sheltered, a good place for a longer stay. The visitor center is located in Ford House, a historic building (built 1854) along Main Street in the town center. Mendocino is located just off CA 1, so the town is quiet, and retains its charming, historic character, the main streets lined with an interesting variety of shops and businesses. The headlands extend around three sides of the residential district, with the largest open areas to the north and west. A loop road (Heeser Drive) runs along the edge of the promontory for about a mile, past four main parking places, while trails follow closer to the rim of the cliffs, and other paths cross the flat, grassy interior. If walking along all trails along every curve of the coastline, the total distance (one-way) would be 2.5 miles. The road is open between 5 am and 10 pm, and the place seems very popular, even on foggy days. The exposed rocks are light brown to orange just below the rim, relatively soft and easy eroded, while lower down are harder, grey rocks (greywacke sandstone), more jagged in appearance. The geology is similar to other places along the Pacific coast but without the intricate tafoni formations, found for example at Salt Point to the south. 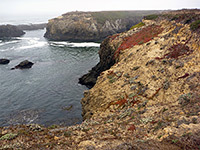 The cliffs are generally about 50 feet above the ocean, and mostly sheer or too steep to climb down, but a few places allow routes to or near the water's edge. Six relatively large, flat-topped topped islands lie just offshore, plus many smaller rocks. The islands and cliffs tend to be broad and angular, with rough textured surfaces, not particularly photogenic, especially during the dull, misty weather that often predominates. 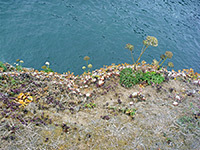 Sea-facing slopes are covered with dense patches of succulents (dudleya farinosa, sedum spathulifolium and the non-native carpobrotus chilensis and carpobrotus edulis), while inland are many dozens of other wildflower species. 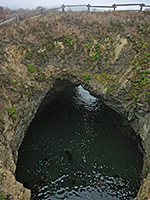 Towards the southwest, the promontory breaks up into several deep, narrow inlets, lined by sea caves, large and small; the biggest is 175 feet long and has a huge opening in the roof about half way along, fenced off above for safety. 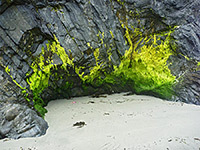 The northern end of the cave opens out to the main beach in the state park (Portuguese Beach), a south-facing, 600 foot long stretch of light colored sand accessed by a series of steps. The low cliffs harbor several seeps, home to a different set of wildflowers to those on the more exposed plateau, such as monkeyflower and nasturtium. Big piles of driftwood are scattered along the high water mark. Further north in the park are other, smaller beaches, sand or pebble, mostly inaccessible. The largest offshore rock is Goat Island, topped by a sizeable grassy area, surrounded by extensive terraces at high tide. More jagged stacks and cliffs are found along the north edge of the peninsula, and also two somewhat larger, sandy beaches, one overlooked by a grove of wind-sculpted cypress trees. Most of the inlets look very deep, buffeted by dark colored water, and they contain large amounts of kelp.